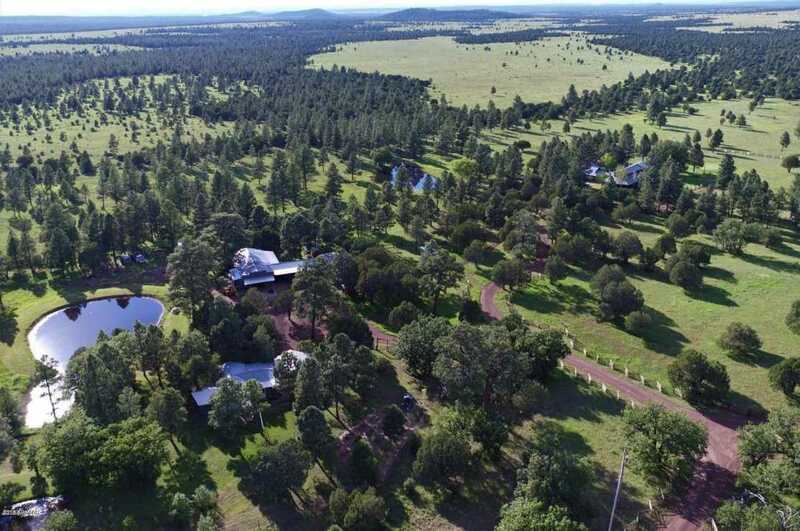 Pinon Ranch is a peaceful & serene hidden gem in Eastern Arizona’s high country. Private location but just 15 minutes from town. Experience the fabulous 4 seasons: snow in winter, spring thaw, beautiful summer, fall flowers & elk bugling. Main residence is 3bd 3.5ba(3 suites) 3659 sq ft open & bright kitchen w/tile counters, real wood floors in great room & extra-large new addition family rm, recessed lighting, 2 masters one up & one down, floor to ceiling windows & doors open to beautiful yard surrounded by wildlife habitat & USFS, large laundry, two fireplaces (one gas and one wood). Guest house is 1bd 1ba 403 sq ft. & caretakers home is 2bd 1ba 1172 sq ft. Double car detached garage attached w/ breezeway to guest house. 3 Small ponds on property + close to Sponsellor Lake. Directions: Wht. Mtn. BLVD to Penrod to Porter Mtn. Rd. property is just past NF 182. Approximate size: 3698680.00 sq. ft. Please, send me more information on this property: MLS# 5815691 – $3,500,000 – 9957 Porter Mountain Road, Lakeside, AZ 85929. I would like to schedule a showing appointment for this property: MLS# 5815691 – $3,500,000 – 9957 Porter Mountain Road, Lakeside, AZ 85929.